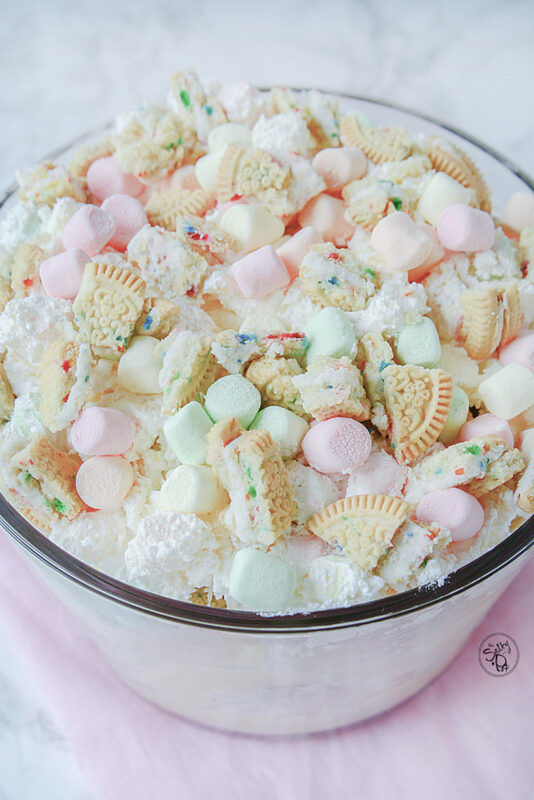 My fabulous reader, please meet – Marshmallow Cookie Dessert!! Ain’t she pretty??? This unique cutie will bring “ooohhs’ and “aaahhs” from all the little faces who see it! (and maybe from the big faces too..lol!) It’s a great alternative to the traditional birthday cake and let’s be honest, way more exciting. It can be used for any celebration actually. Birthdays, anniversaries, graduations, Christmas, cookouts, the turtle’s birthday, .. heck.. did you buy a new lamp? Yaay! Time to celebrate! 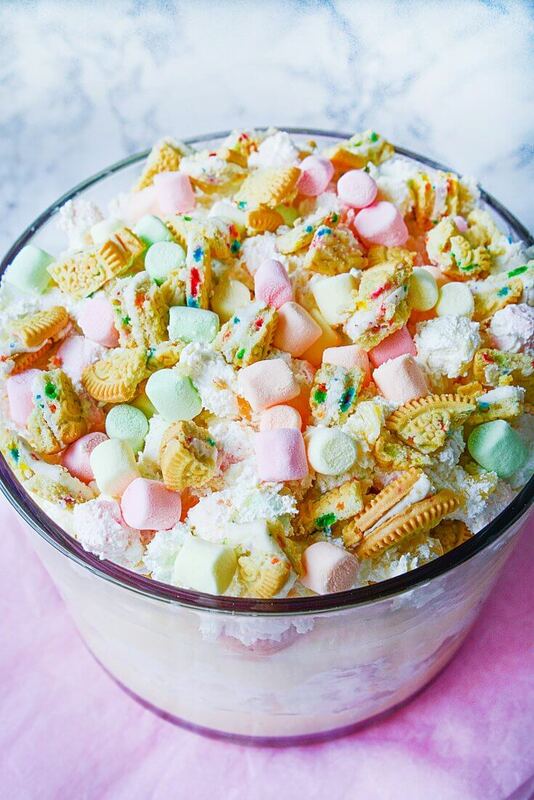 WHAT DO I NEED TO MAKE THIS COOKIE DESSERT? 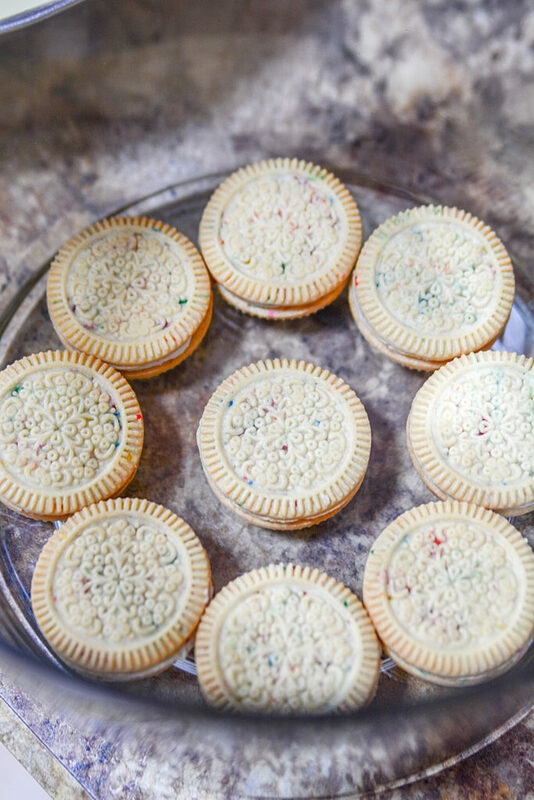 Birthday Cookies – Now, you can use any sandwich type cookie you’d like, but because I’m making this dessert for a birthday celebration, I’m going to use birthday cookies. Makes sense, but again, use any awesome and tasty sandwich cookie you prefer! 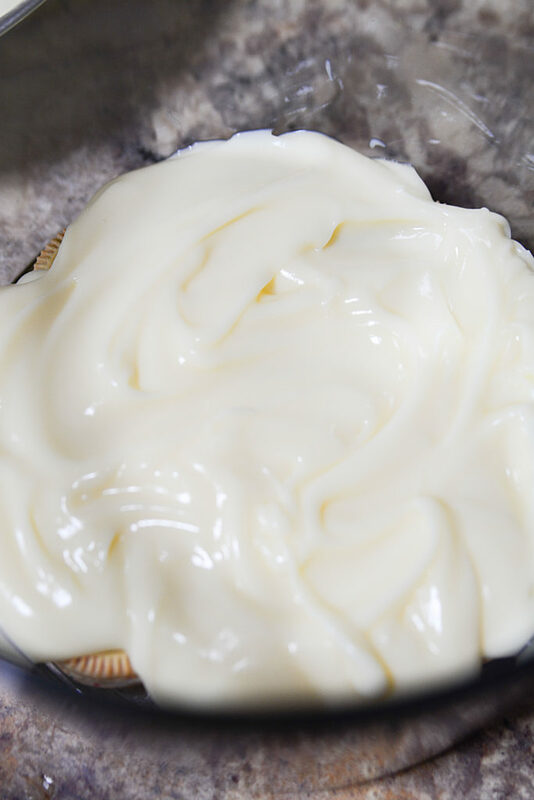 Vanilla Pudding – I used instant vanilla pudding for this recipe, but feel free to switch it up. Cooked pudding (as long as it’s cooled), banana pudding, butterscotch, pistachio, etc. I’m not sure I’d use chocolate pudding because well… I dunno… I just think it wouldn’t be as pretty? Unless you’re using chocolate cookies or Oreos or someth……… ohhhh I just got a great idea! I think I just thought up another cookie dessert!!!! Stay tuned for that one! 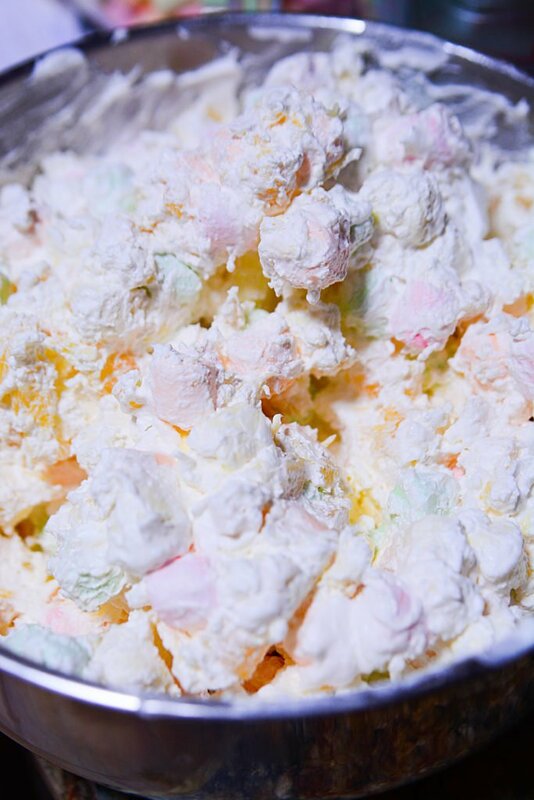 Whipped Cream – You can use cool whip (which I used here) or use a homemade whipped cream if you prefer. If you use your own homemade one, make up the cookie dessert just before you serve it as homemade whipped cream might not stand up to a ‘make ahead’ method. 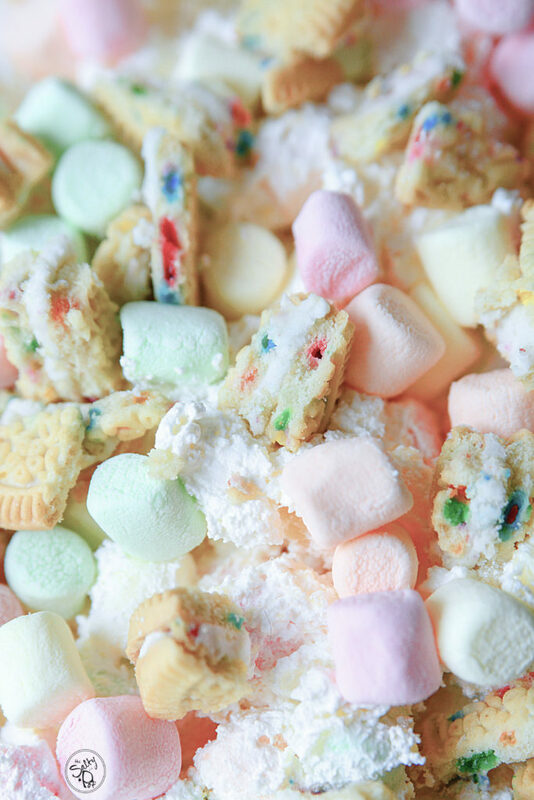 A few of the best things about this marshmallow birthday cookie dessert well, actually, I just mentioned some of them. Birthday cookies and marshmallows. Plus, it’s a make WAY ahead (the morning of), and it’s NO BAKE! Yaaay for no oven turning “onning”! A ‘NO BAKE’ COOKIE DESSERT – WOOOHOOO!!! It’s pretty much just a construction type recipe. Nothing to bake or no recipe-in-the-recipe kind of things. Simple assembly is all that’s required. Hint: If you get little hands to help you, they pretty much make that the most important thing about the entire event, so they can’t help but LOVE. EVERYTHING. ABOUT. IT. … which of course.. makes you the hero of the day. Do I Need A Special Bowl To Make This Dessert? I made this dessert in a trifle bowl but the bottom stand is removable and I forgot to put it under the bowl when I was photographing it. 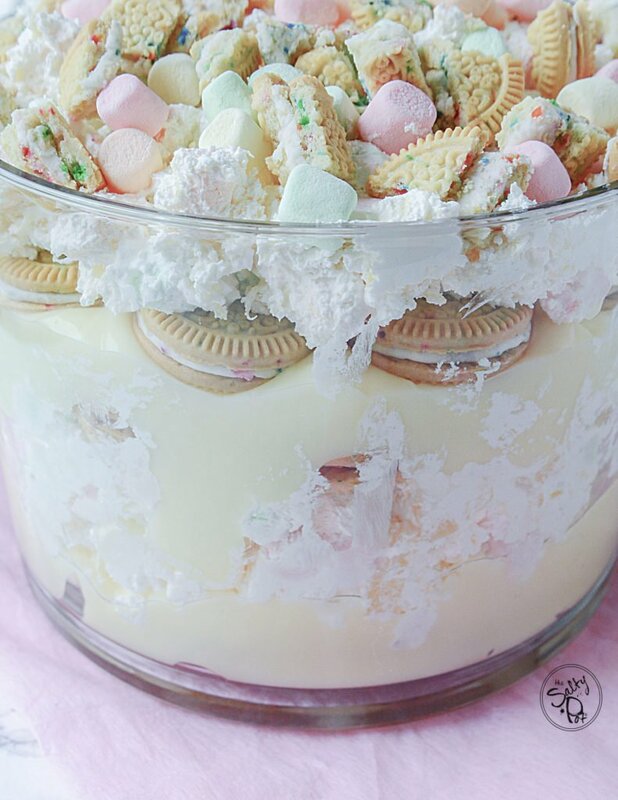 You can make this in any vessel you’d like, as long as it can take some height with the layers of cookies, pudding and of course whipped cream and marshmallows. YOU GOTTA HAVE ALL THE WHIPPED CREAM, PEOPLE!!! How Can I Change Up This Dessert Recipe? I’ll write up the “recipe” below, but again, it’s pretty much just an assembly type of dessert, and you can play around with it as you’d like. 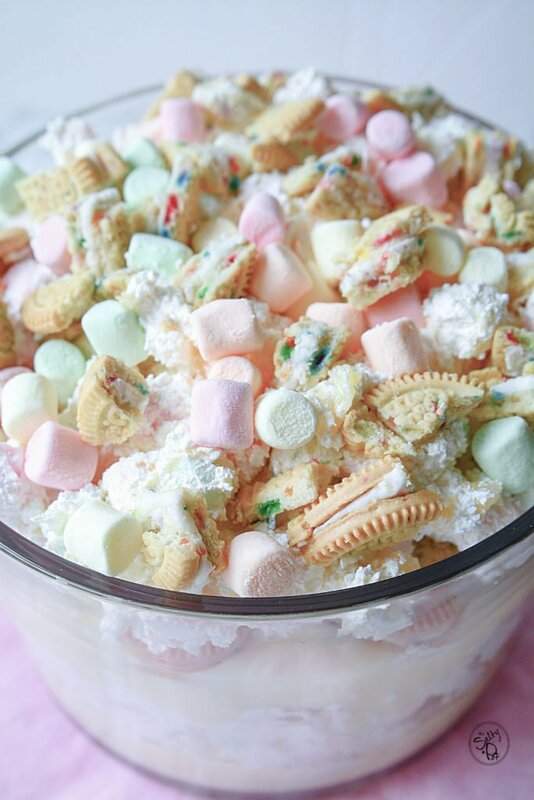 If you want more cookies, then instead of putting them in whole, crush them up and sprinkle them in the layers. You’d obviously have to buy more cookies, but you get what I’m saying. Maybe make the whipped cream layers thicker it that strikes your fancy… add more pudding.. MAKE IT YOURS, my super creative reader!! I know we all live super busy lives and that’s what makes this adorable cookie dessert so nice. You can easily put it together first thing in the morning, and its flavors will combine as it chills. No baking, no frosting. It’s all built-in. 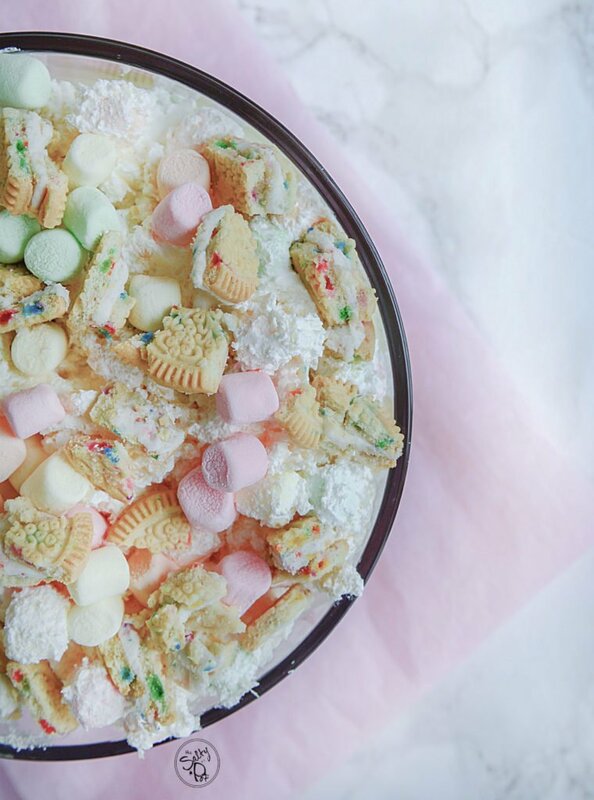 The only thing you have to add is the candles, and this marshmallow birthday cookie dessert can handle that too! If you make this dessert for a special celebration, I’d love to hear about it below!! Thanks so much for taking the time to stop by The Salty Pot today! I hope you have a wonderful celebration! A super easy, delicious and no-bake cookie dessert that is a fantastic alternative to a regular birthday cake! « 20 cozy drink recipes to cuddle up with!